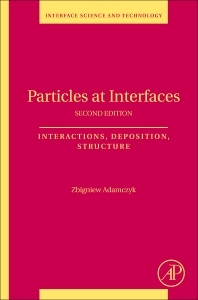 Particles and Interfaces: Interaction, Deposition, Structure, Volume 20, Second Edition unifies particle and protein adsorption phenomena by presenting recent developments in this growing field of nanoscience. While experimental data is available in vast quantities, there is a deficit in quality interpretation of that data. This title provides such information, emphasizing the basic physics behind practical problems, thus empowering the reader to estimate relevant effects. The book includes solved problems of particle transport under non-linear conditions and their relevance to predicting protein adsorption, including an entirely new chapter devoted to polyelectrolyte and protein adsorption at solid/liquid and solid/gas interfaces. Chemists and chemical engineers, consultants etc. in the following industry branches: automotive, cosmetic, chemical, electronic, pharmaceutical, flotation, pulp and paper. Students enrolled in courses in chemical engineering, hydrodynamics, colloid science, physical chemistry, catalysis, surface science, biophysics. The author, Zbigniew Adamczyk, PhD, DSc, Full professor at the J. Haber Institute of Catalysis and Surface Chemistry, Polish Academy of Sciences, Kraków, Poland, is an experienced scientist, author of over 300 publications, 30 review papers, book chapters and books. His broad research interests comprise mechanisms and kinetics of adsorption of polyelectrolytes, nanoparticles and proteins, electrostatic interactions, electrokinetic phenomena, hydrodynamics of polyelectrolytes and proteins in the bulk and at interfaces, diffusion and transport of particles to surfaces. Highlights of his scientific activities, both in the theoretical and experimental domain, comprise elaboration of the convective diffusion theory, quantitative description of adsorption kinetics from multi-component mixtures, new hybrid model of protein adsorption and desorption, generalization of Langmuir isotherm, fluctuation theory of adsorption at heterogeneous surfaces, theoretical description of electrokinetics phenomena for particle and protein covered surfaces, developing the concept of electrostatically driven protein adsorption.